One of my favorite Suites from the Stampin’ Up Annual Catalog is the Birthday Memories Suite. Bright and cheerful, colorful and very retro. Loved it from the first time I got to play with it! With the cold, gloomy winter weather we’ve had so much of lately, I’ve begun to be drawn to our more colorful Suites and decided I had to create a card with this adorable little girl. One of the BEST things about Stampin’ Up is how everything is coordinated for you. The Birthday Memories Designer Series Paper is the background paper here. The Birthday Girl, present and floral bouquet were all cut from the Designer Series Paper using the Birthday Friends Framelits Dies with the Big Shot. The little girl and the Daffodil Delight Double Stitched Ribbon are both mounted on Pacific Point Cardstock, which is one of my very favorite Stampin’ Up colors. The sentiment was stamped using the Birthday Delivery Stamps Set. See how it’s all coordinated for you?! Makes creating beautiful projects so much easier! I must admit that I came across a picture a couple of days ago that inspired this card. One of those “long ago” pictures! Yep, that’s me. We had a Fun Folds Cards Class and made these cards using this same Suite. See how bright and cheerful this set is? And here’s the GREAT thing–the stamps, dies and Designer Series Paper are all three available in a Bundle that saves you 10%. Purchase this set through March 31st and you’ll get a FREE Sale-A-Bration Item of your choice! Want to know more about Stampin’ Up and how you can join in the fun? Our Crafting on the Hill Monthly Team Meetings are held the first Monday of each month. This is a monthly time for Team Achievement Recognition (with prizes! ), an overview of Stampin’ Up news and events, as well as stampin’ time and the fun of being together as a Team. AND a Door Prize! Please feel free to join us to hear more about joining Stampin’ Up! Light sandwich supper served beginning at 6 PM. Please RSVP by Sunday, February 4th. Create an 8 X 8 frameable sampler using the new Stampin’ Up Sweet Soiree Specialty Designer Series Paper and coordinating Embellishment Kit. You’ll also use one of the new Silver Mini-Gable Boxes to create a coordinating Gift Box. Keep them or gift them! Please bring scissors and adhesive. Adhesive is available for purchase. Cost of this Class is $15. RSVP with Payment by January 26th to register for this fun class! Three times to choose from! This monthly Quick and Easy Cards Class is a great way to build your cards stash with some beautiful handmade cards. For this class we’ll be using Petal Pallete Suite to make 6 cards, 2 each of 3 designs, including envelopes and inside sentiments. New Customers: You will receive a FREE copy of both the 2018 Occasions Catalog AND the Sale-A-Bration Brochure! **Class is $15 or FREE with a $20 minimum product order. FREE Sale-A-Bration Product with each $50 Product Order! **Please bring adhesives and scissors. I do have adhesive available for purchase. **RSVP for this FUN class by Sunday,February 11th. **Bring a friend and you and your friend select 3 handmade cards from my cards stash. **Held at Crafting on the Hill Studio just north of Jasper. Say hello to a new world of colorful creativity with Stampin’ Up’s premiere alcohol markers. These high quality dual tip markers each have a light and dark shade to give you the best blending experience. 4. Time of instruction and practice with the Color Me Happy Stamp Set. If you do not have the Memento Ink Pad, you may add $6 to the class fee and I will order you one. I also have SNAIL adhesive runners available for sale. Class fee is $28. Deadline to sign up and pay class fee is Thursday, February 8th, so class supplies can be ordered. You may let me know your color choices when you sign up and pay. You may view the available colors at www.craftingonthehill.stampinup.net. ONE LAST EVENT FOR JANUARY!! And it’s FREE!! Come find out more about Paper Pumpkin and how to earn FREE Sale-A-Bration Products! Everyone who is one of my Paper Pumpkin Kit subscribers or customers is welcome to attend this FREE Event! Just bring your Kits, adhesives and scissors for some Paper Pumpkin Kit assembly FUN! I’ll have my inks available for use, as well as the stamp sets from past Kits. If you are a Paper Pumpkin Subscriber, check out the past and refill Kits available on my store! Not a subscriber yet? Come and play and make TWO FREE Paper Pumpkin Kit cards so you can see for yourself how much fun this monthly Kit really is and become a subscriber! RSVP by Sunday, January 28th. Stay safe and stay WARM!! March 1st and SPRING are just around the corner!! Contact me today to find out how to get your FREE Occasions Catalog and Sale-A-Bration Brochure! Want to know more? Go to my website at www.craftingonthehill.stampinup.net and click on the “Join the Fun” tab. Or contact me TODAY and let’s get you started! Just contact me and we’ll talk! What a winter we’ve had here in the beautiful mountains of North Georgia! Arctic cold temps (colder than Alaska! ), snow and ice. But I’ve begun my SPRING Countdown on my Facebook Page, which I’ve done for several years and now have requests for every year. A fun way to look forward to spring! The Painted with Love Specialty Designer Series Paper is just so elegant and gorgeous, I’ve loved working with it. The whole “Love”ly Suite can be found in the NEW Occasions Catalog. I love samplers because they’re just something pretty to create and enjoy, as home decor or a gift. It’s something I’ve been wanting to do for awhile now, and have decided to offer a Class in February. But today I really wanted to work with this Painted with Love Designer Series Paper to create a Valentine’s Sampler. One of my favorite things about Stampin’ Up products is that everything is coordinated for you, which helped inspire me in the design of the Sampler. I used an 8 X 8 Melon Mambo base. The Whisper White squares are 2 1/4″. I used 9 different patterns from the Painted with Love Specialty Designer Series Paper cut into 2″ squares. The accents are a gold Metallic Foil Doily, as well as hearts cut from the Lots to Love Box Framelits Dies in gold foil, Sweet Sugarplum and Powder Pink. The large gold foil hearts are the Sunshine Wishes Thinlits Dies. I also created a coordinating card to go with it, using some of the same products on a different scale. So easy when Stampin’ Up products are already coordinated for you! Despite the weather, we were able to have the Quick and Easy Cards Classes last week and had a fun time creating some cards and a 3D project. We used the Lots to Love Box Framelits Dies to create a box decorated with the Painted with Love Specialty Designer Series Paper. Calypso Coral Cardstock was placed behind the die cut image, then the die cut heart was used on one of the new Whisper White Narrow Note Cards and Envelopes. You can fit four of these cute little cards in the box! The Bloomin’ Love Stamp Set was used on the other card, stamped in Soft Suede Ink. Strips of Whole Lot of Lovely Designer Series Paper provided the perfect background for this beautiful stamp. The sentiment is from the You’re So Inspiring Stamp Set in the new Occasions Catalog. With EACH $50 Product Order, you earn a FREE product of your choice from the Sale-A-Bration Brochure. That’s right–FREE!!! 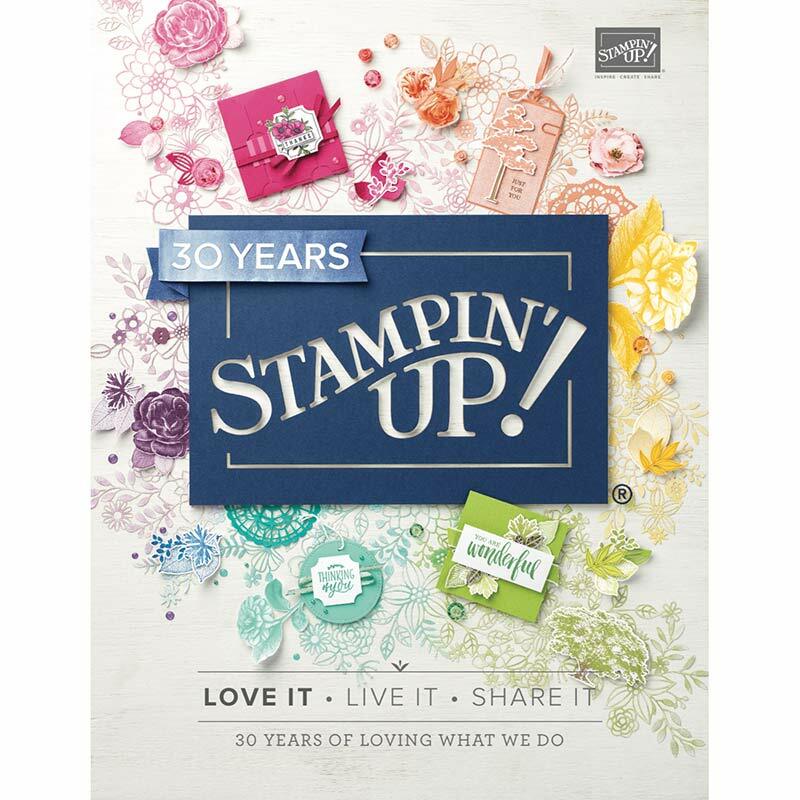 And this year Stampin’ Up has added even more rewards for purchasing a $100 Product Order, including a coordinated Stamp and Dies Set. And there are actually THREE WAYS to benefit during Sale-A-Bration! Shop and get a FREE Sale-A-Bration Item with EACH $50 Product Order. No limits to the number of FREE Sale-A-Bration Items! Host a party during Sale-A-Bration and get $25 EXTRA Stampin’ Rewards with a $250 party. That’s in addition to the usual Stampin’ Rewards and the Hostess Gift you get from me! Just invite several of your friends for some FUN stamping time and I’ll take care of the rest. You can even host your party here at the Crafting on the Hill Studio. Contact me today so we can get YOUR party booked. Win-win!! JOIN THE CRAFTING ON THE HILL TEAM and get two FREE Stamp Sets! Join the Crafting on the Hill Team January 3rd-March 31st and get TWO FREE STAMP SETS from the Annual or Occasions Catalogs, a value of up to $101!!! That’s in addition to the Ultimate Bundle Starter Kit of $125 in product of YOUR CHOICE for $99, shipping included. PLUS, you will get a 20% discount for at least six months and become a part of this FUN group of crafters!